Hey guys, Dr. Axe here, founder of DrAxe.com and Doctor of Functional Medicine. Today I’m going to be sharing with you my top foods and supplements for overcoming high blood pressure. Believe it or not, blood pressure is something that can be easily balanced out if you follow the steps here that I’m going to talk about in this video. First, let’s talk about what causes high blood pressure. Most of the time when you’re reading online or in the media today, you’re going to see things like excess sodium consumption, emotional stress, poor diet, and lack of exercise. Those are four of the big ones that people say may be causing high blood pressure. Let’s start off talking about diet. What is the best diet for blood pressure? There are three specific nutrients you want to make sure that you’re getting in your diet if you have high blood pressure. Those include potassium, antioxidants, as well as omega-3 fatty acids. In fact, if I had to throw a fourth one in there I would say magnesium. If you can add those four nutrients into your diet and eat foods that are high in those substances, you’re going to see your blood pressure really balance out there very quickly. That’s going to be a diet that’s high in fruits, vegetables, sprouted nuts and seeds, and organic, wild-caught meats. One of the things you may do after watching this video is go to my site, DrAxe.com, do a search for potassium rich foods, magnesium rich foods, and omega-3 rich foods. If you go and look at those food lists, you’ll see things like avocados are packed with magnesium and potassium. Doing guacamole would be great for you or consuming chia seeds or wild-caught salmon or other foods like that. Figs are super high in potassium as well. Again, I would go online and look up foods that are really high in potassium, magnesium, omega-3 fatty acids, and antioxidants as well. We have actually all of those top ten lists there on DrAxe.com. That should be diet. Some things you want to avoid, diet wise, when you’re following a healthy blood pressure diet is avoid excess sodium intake. You don’t want to overdo the salt. A little bit of sea salt is fine, but definitely stay away from the processed iodized salt. Really eliminating processed sugar. Processed sugar will definitely cause your blood pressure to spike. Then, of course, processed and fast foods that contain hydrogenated oils, we know those are inflammatory to the body. That inflammation in the arteries will cause blood pressure to rise and actually will cause high cholesterol as well. Again, you get those foods out, add in those mineral and vitamin rich foods, and you’re going to see immediate results in your blood pressure. Then in terms of the best supplements to naturally treat blood pressure, I want to go over the top ones here. The first one would be fish oil. Fish oil is high in omega-3 fatty acids. Those omega-3 fatty acids, called EPA and DHA, are highly anti-inflammatory. We know that high blood pressure is in part caused by inflammation. If you can start adding in wild-caught fish into your diet and taking a good quality fish oil supplement at about 1000 milligrams a day, you will see results very quickly in your blood pressure. The second most important supplement to take for blood pressure is magnesium. Magnesium helps relax your blood vessel walls and improves circulation and reduces stress in your body. All of those things are benefits of taking magnesium which will naturally lower blood pressure. Typically, you want to take 250 milligrams of magnesium 2 times a day. I recommend a magnesium chelate supplement when you take that. The third supplement you may want to consider taking if you have high blood pressure is Coenzyme Q10. This is absolutely essential as well if you’ve ever taken a cholesterol lowering medication. Coenzyme Q10 is an antioxidant that supports heart health and circulation. It also acts as an antioxidant. Again, Coenzyme Q10, about 200 milligrams a day is a great supplement for helping blood pressure issues. The fourth supplement would be garlic. You can actually eat garlic or take garlic extract. Garlic contains allicin as well as other phyotnutrients that kill off bad bacteria in your body and act as antioxidants to help lower blood pressure. You can also use lavender essential oil. Lavender oil has been shown to reduce stress which is one of the major causes of high blood pressure. Typically take about two to four drops of lavender oil, rub it on your neck, and you will see that start to improve your overall blood pressure as well. Last but not least in lowering blood pressure, I would recommend daily exercise. You don’t have to exercise every day, but just 20 to 30 minutes 3 times a week of exercise can make a huge difference. I recommend checking out interval training like my BurstFit program as one of the best ways to get fit fast. Also, just in general, any form of exercise, whether it be weight training, walking, Pilates, barre classes, or even group classes, all of those are effective forms of exercise that help naturally lower your blood pressure. 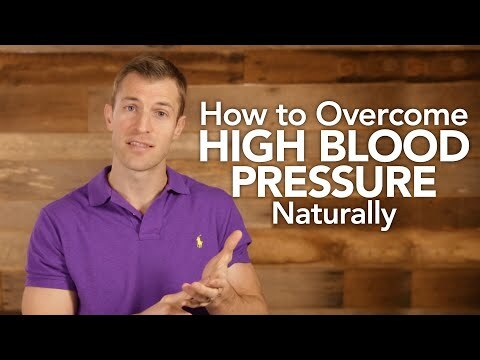 Hey guys, I hope you’ve enjoyed these top tips to naturally lower blood pressure. If you want to learn more, hey you can check out DrAxe.com. Simply search high blood pressure. I’ve got more articles and tips on there as well. Hey guys, this has been Dr. Axe with my top healthy blood pressure tips. .